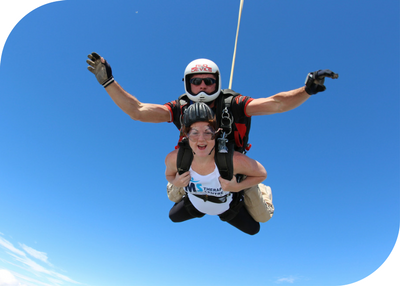 One of the most exciting ways to fundraise for the Berkshire MS Therapy Centre, skydiving is the stuff that dreams (or nightmares) are made of. You will climb to 10,000 feet and, attached to an experienced instructor doing all the hard work, you will freefall at up to 130 mph before gently gliding to earth. Your skydive will be organised by a company called Skyline who work with airfields across the UK. We are currently planning a special skydive to mark our twenieth anniversary, read more about it here. Did you know? You can skydive for free AND support the Berkshire MS Therapy Centre by raising a minimum of £395. For more information contact Yvonne@bmstc.org.